23-Oct-2012 -- A straight shot – at least that’s what we thought: Thirty kilometers from the nearest town, and then five kilometers up a ridge from a dirt road; and the Google Earth pix looked like the vegetation might be sparse from man-made interaction such as farming or logging. Add to that the fact that this was a very colorful and interesting area, with Hmong, Dzao and Giay minority people in a distant mountainous part of northwestern Vietnam, and ‘interesting’ industries such as opium farming that are now strongly thwarted by the police. It began as three of us: Tom, an American I met in grad school, Nataliya (Natie) a Russian girl I met in Vladivostok on my attempt of the first North Korean point, and myself. 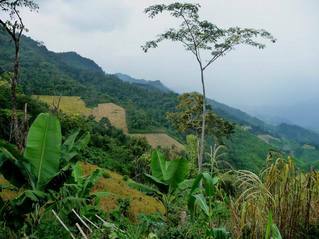 We packed all our provisions and headed from Hanoi to Sapa, Vietnam a mountainous village known for its abundance of hill tribe minorities. Tom was always a bit on the fence about the idea, and by the time we got to Sapa there was almost nothing we could do to talk him into going. His reasons? “Poisonous snakes”, “malaria”, “fearful village people and police who had never seen foreigners and might react in drastic, unpredictable ways”, “protective opium farmers who might use violence”, “a tough 800 meter climb”, “poor communication with locals”, “unknown transport”, “the audacity of us being Americans roaming irresponsibly on land that we had once attacked”. He certainly raised valid concerns and had a lot of reasons to fear doing this confluence along with the fact that maybe he just didn’t enjoy the prospect of it at all in comparison to doing a more organized, constrained trek. He headed off to the Annapurna circuit in Nepal instead. We paid two motorcycle drivers to get us from Muong Lay, down a short bit of road and then down the 25km of dirt track to the point where we would set out on foot, making our way perpendicularly to the confluence. Not all went according to plan. On the tight curves above a cliff canyon down to a river called ‘Da’, Natie’s driver’s motorcycle in effect said “Nyet” and took a spill in the road. There were no injuries and it was a minor setback - comparatively. Then came a the proportionally major setback. Five or six kilometers before our intended motorcycle destination, the road was completely gone and turned into a construction site cat-track above towering cliffs into the canyon below. It was slippery, there was nothing to hold on to, and there were actual small landslides happening when we attempted this cat-track. We deemed it too dangerous. Our only other option, which we ended up doing, was to backtrack a kilometer or so and go way down to the river. This resulted in us crossing the river 6 times down in the canyon to even get in the direction we wanted. This slowed us down and set us back even more mostly because Natie found walking on the sometimes jagged rocks unbearable to bare feet. Further down (actually upstream) from the cliff’s ‘rude’ interruption of our path, the road did resume in a decent state. Nevertheless, we ended up barely making it back to this good stretch of road before it was our turn-around time. Instead of going the 25 km or so back to Muong Lay, we decided to try our luck in a local village and see if people would be ok with us staying in Nam He. This was even more of a backtrack, but the largest village in the area. We only packed for a day-trip but we were willing to sacrifice having soggy feet, dirty, sweaty clothes and no toothbrushes for another day. The people in Nam He were very friendly and offered us a place to sleep. Although initially there was a language barrier, we soon discovered that the village was a major primary and secondary school location and there were English teachers with rudimentary English skills, so we had quite a bit of communication. There was electricity, people were using cell phones albeit with very spotty coverage, and there was even a laptop computer that they used to play songs such as My Heart Will Go On from Titanic! They treated us to a nice dinner of green beans, chicken and rice and lots (!) of homemade alcohol (which, incidentally, reappeared for the next morning’s 6AM breakfast!). We went to sleep in a house with about 8 other people, though the beds were divided by barriers and curtains. The next morning we began our second attempt. We made it more quickly past the river crossing portion (shortened to 4 crosses because we found a short cut and Natie bought plastic slippers in the village), and then walked several kilometers more down the road. Across the river from us was what we knew from Google Earth as the closest village to the confluence – Na Sai. Reaching this village was a major milestone. The villagers in Nam He had given us a little bit of water for our journey but we needed to go to Na Sai to ask for more. We also wanted to see if we could borrow a machete because we knew we would likely encounter thick vegetation. However, any chance of an easy walk to Na Sai was quickly dashed. The village is located on the other side of the river canyon, connected by a harrowing rope bridge made more harrowing by our discovery that about 15 of the slats were smashed about 2 meters down caused, as we thought, by something like a heavy motorcycle. The bridge appeared too dangerous and precarious to cross. We never saw Na Sai (except from across the river), and we never figured out how villagers got to and from the village. We did, however, come across a sort of stand on the road, we think for road construction workers perhaps, where we were able to refill our water bottles with boiled water and buy 25-cent packages of poor-quality cookies that may have been made with sawdust for all we knew. After continuing more kilometers down this newly constructed dirt road, eventually the road turned into a road that probably existed 20 years ago and was now overgrown. And then even that road completely disappeared when we got to a wide river bend. We were finally at the point where we knew we had to make a perpendicular deviation up a valley or a ridge for that last 5 km to the confluence. But we were dangerously low on time now – the thought of staying in another village with soggy shoes and socks and sweaty, dirty clothes was not a pleasant prospect. Perhaps we were too focused on the fact that we had a nice hotel with a swimming pool waiting for us back in Muong Lay! And this part of the trip was totally discouraging. There seemed to be only thick vegetation and not a single way up a valley or ridge to the confluence, as we had hoped. It was also very slow moving including several more time-consuming river crossings, and negotiating fields of river boulders. We found a cluster of houses slightly smaller than what could be considered a village, and soon after, at sometime between 12:00 and 1:00 on that day, miraculously, we found a trail to take us up to the ridge leading to the confluence. This was no easy going though. It was dauntingly steep while it was about 35° C (95°F), humid and sunny. At this point, we knew our chances of making it back to Muong Lay that night were becoming slim to none. And we became less sure that we would even make it back to Nam He, where we stayed the previous night. Natie became completely exhausted and started to slow down substantially. I was worried about her. She had also not packed enough water and was taking the rest of mine. Additionally she was without sunscreen (it was only supposed to be a day trip, right?) and my sunscreen was running out. We negotiated up through steeply-sloped rice fields in the glaring sun. We eventually discovered field workers who eked out a simple existence living in small huts. I finally convinced Natie to ask some of the mountain villagers for water, particularly when we realized there were streams so that they didn’t need a huge slog to haul the water from the river below. If there was any optimism at all, at about 2:45 we made it to a villager's mountain house with a new viewpoint to the confluence. We were still 3.35 km away. Out in the direction of the confluence there were two or three of those almost vertical mountain pastures so I realized we would probably be able to proceed a little bit further toward the confluence. But the terrain was very steep with lots of ups and downs and thick vegetation in the non-field parts. And if you looked out at what should be about 3 km, there seemed to be nothing but steep slopes and thick vegetation. Although we had more water from the villagers, Natie was really exhausted and I could tell she didn't want to go further - she even said so. With nightfall at 6PM we had no way of even returning to Nam He, and our sleeping situation for that night was in jeopardy. Add to that, some black clouds were coming in and threatening rain. I proposed the idea of staying with some of these people in their mountain huts but they seemed to have too many people, sparse provisions and really a struggling existence. I knew she would not have the will to hike up that steep hill another day and we were really stretching the amount we could do overnighters with only the planning for a day trip! I decided to call off the confluence hunt at this point and we headed back down. As we walked back down, eerily there was a gunshot. We thought about Tom warning us about the opium farmers. At the time, we were approaching one of the huts that had given Natie water, but there were mostly children there from our vantage point. Natie thought the gunshot came from behind us. We proceeded slowly and carefully. The people at the mountain hut were smiling and friendly so it didn’t seem they would be the culprits. After all, the origin of the gunshot remained a mystery. As we proceeded downhill there was a 30 minute downpour that soaked our clothes and shoes. Wet and dirty and with nightfall upon us, our only hope was that the people in the cluster of houses at the foot of the slope would allow us to stay the night. They turned out to be teachers too and though they nodded affirmatively, they were busy teaching, and gave us badminton rackets and a shuttlecock. Exhaustedly we still had a little energy left over to have fun and flail around hitting the shuttlecock. It’s worth noting that on this second village night, our bed was made of sticks with a plastic faux rattan mat on it- possibly the hardest surface I've ever slept on. All was well the next day. We spent half the day returning to Muong Lay and, the motley crew we were, took relief by immediately jumping in the Thanh Binh Hotel swimming pool! #2: Muong Lay, the closest sizeable town to the confluence and our starting point. #3: Getting motorcycle rides for 30km up the remote canyon. #4: Typical house on the way to the confluence with sustenance of dried river fish and rice fields. #5: Natie nervously attempting to cross the perilous cat-track with a deathly drop below. #6: This was real - the hair-raising drop below. #7: Our alternative was to climb down the canyon and ford the river several times. Me (Greg) crossing. #8: Defeated on the first day, we retreated to this village, Nam He, completely separated from the outside world by dirt roads. #9: Natie with 2 of the local villagers the next morning after a breakfast of rice, chicken and homemade alcohol. #10: The outside view of the place in Nam He where we spent the night.